That's it, the final stretch before the start of the baccalaureate has begun. Thousands of high school students will soon throw themselves into the big test bath, after a busy and stressful school year. French, mathematics, physics and chemistry, history and geography, English, Spanish, German, philosophy, SES... so many challenges that are scary, especially because of their high coefficient. So, if you don't want to redo your senior year, it's better to revise without counting. First of all, let's start with a subject that is often ignored by students, I named mathematics. Complexes, integrals, functions, statistics, probabilities, logarithms, exponentials... so many barbaric names that make the ears of high school students tremble, and often demoralize them in a matter of seconds. But that's not to mention GraphMath's support. 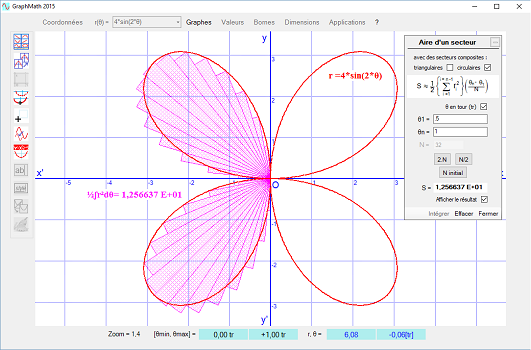 This free software provides high school students in S, ES and L with a simple and complete program to draw all kinds of mathematical curves, such as functions, tangents and other derivatives. Another challenge where students often feel very uncomfortable is foreign languages. French high school students are known to be among the worst European students in foreign languages, regardless of the language: English, German, Spanish, Italian, etc. 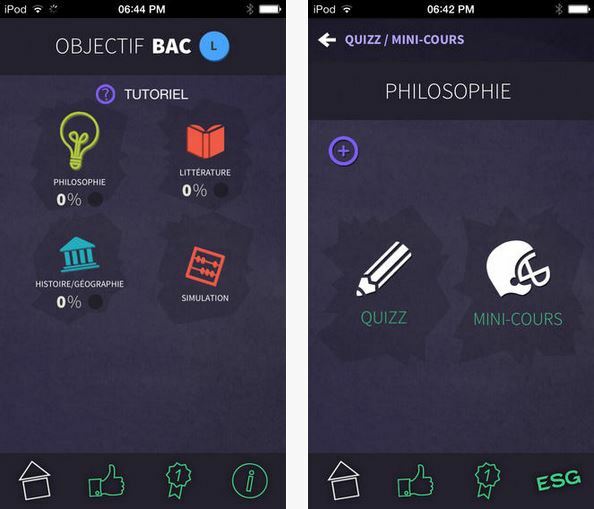 To make up for this deficit, and try to improve your level before the baccalaureate, we recommend that you download Maxi-School for free. 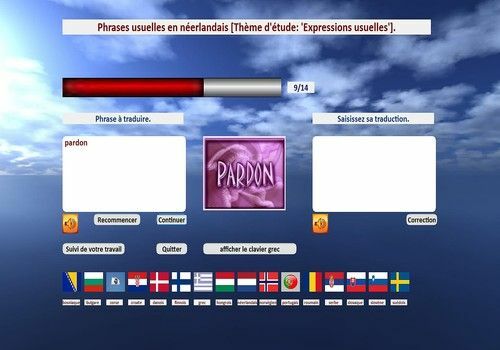 This software includes several modules for grammar, spelling, conjugation and even translation. Thanks to it, you will not become bilingual, but you will be able to understand the text in the written test and the questions in the oral test of the baccalaureate. If there is one subject where there is a lot of data to learn, it is history and geography. Between the dates of major historical events, and maps of countries around the world, everything is in place to clutter the brains of students, who wonder if they will ever be able to retain so much information in such a short time. Well, you can do that with the freeware OOo.HG. This all-in-one solution actually includes not one but three different software packages. 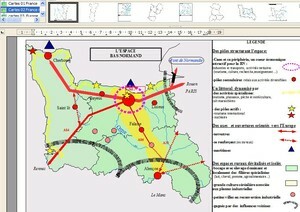 The first, Cart'OOo helps you to make maps for the geography test, the second, Atlas'OOo provides you with more than 801 maps and sketches on several different themes. Finally, the third and last software, Chron'OOo, gives you all the tools you need to create axes and timelines that greatly facilitate learning and memorizing dates. Let's now talk about a software program addressed directly to Terminale S students. ChemMaths, since it is its name, is one of the best free applications of mathematics and physics and chemistry ever. It provides high school students with more than 450 chemical compounds, 300 different units, including pressure, mass, and time, but also mathematical, chemical, and electrical equations. In addition, the software includes a calculator with 20 constants, and a space to create 2D and 3D graphics. 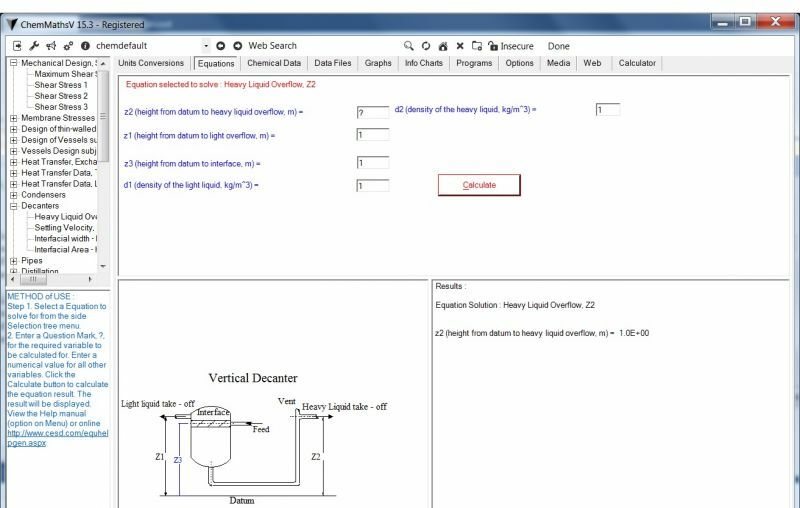 ChemMaths is a free download that can calculate the viscosity and thermal conductivity of compounds in a matter of seconds, as well as convert non-conventional units into their equivalents, and vice versa. While the Baccalaureate exams are almost timeless, the ways of revising them evolve over time. Thus, no more revisions with your notebooks and other handwritten files. Now, let's do some revisions on smartphones and tablets via Annabac 2016. 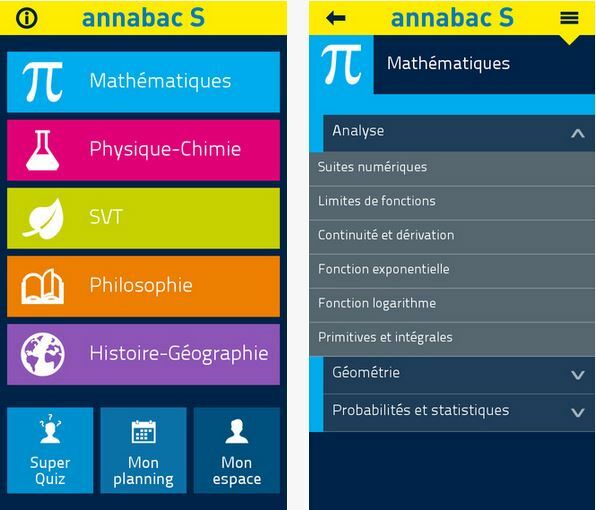 This application for iOS and Android includes the entire year's program for First and Secondary S, ES and L. Thus, high school students can review their exams in French, philosophy, mathematics, history-geography, English, economics, and any other subject that makes up their exam at any time. To do this, they have at their disposal courses, sheets, methodological advice, and a wide range of exercises to practice. In short, the all-in-one that is recommended for all high school students, whatever their field of study. If you are a little more excited about mobile revisions than you are on your school notebooks, you can also download the Objective Bac 2018 application for free. Here again, many Quizzes and other highly specialized revision sheets, which will help you to test your knowledge and especially to memorize the latest information before the day-day. As with the Annabac 2018 application, it covers all the subjects of the year, from philosophy to mathematics, including foreign languages. A good way to have fun while studying, and to have a good excuse to use your smartphone during the study period. 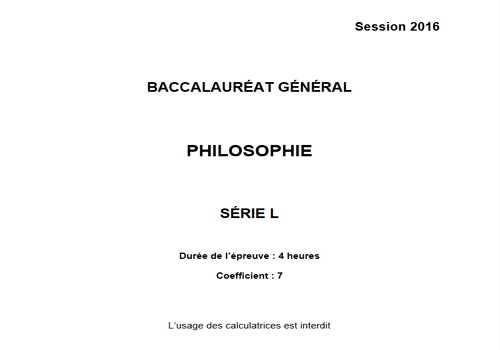 Finally, if you like, you can use the good old-fashioned method of the bac subject to review it. Downloadable and printable for free, this Philosophy topic will allow you to see the themes that fell this year in the L series in Pondicherry, and therefore target your revisions. The goal is to practice writing an essay or text commentary for four in a row, and to make a copy suitable at this time. If you are interested in other subjects, please note that you can also download from our website the subjects of Mathematics, SVT, Physics - Chemistry, English, or History - Geography for the L, S and ES courses. In short, what is the Baccalaureate? Well, it's 70% work and 20% mental. The remaining 10% being the chance, that of chance which will offer you on a silver plate a subject which will inspire you or on the contrary will not excite you at all. What is certain, however, is that without good organization your revisions are useless! So, in addition to the free software seen above, it is essential to have small tools to manage your time well. Therefore, the first thing to do is to prepare a revision schedule. The Google Calendar application can help you in this way. Easy to use, it allows you to integrate your appointments, birthdays and tasks in a single calendar as quickly as possible. This way, you will be sure not to miss the Bac and especially to enjoy the Euro 2016, once your exam is over. The second step is the creation of the revision sheets. To do this, we recommend the Woonoz software. The latter provides users with Bloz, in other words, blocks of cards, designed to facilitate data storage. This learning engine will avoid you wasting time copying your lessons on card index cards, and will indicate the main elements to remember. No more, no less! Third step, worked in limited time. There's no need to spend 20 hours a day working on your revisions. If it gives you a clear conscience, it is objectively useless from a productivity point of view, as the brain needs to rest and eat other than by mathematical formulas or philosophical notions. Therefore, it is important to give you working hours. To do this, you can use the Alarm Clock Pro software. Thanks to it you will be able to program the time of your revisions per day and per subject. You can also use it to solve exercises, to see if you are or not the timing imposed on the Bac (Warning, this software is not a freeware, but a shareware. However, you can test it by downloading its trial version for free). Anyway, last thing to do, relax! If it is indeed essential to work to pass the exam, it is also essential to know how to take breaks and to get out of your notebooks. As stress becomes more and more prevalent as the weeks go by, there is no point in adding a layer of stress by thinking only of that, morning, noon and evening. So, remember to take time out, sleep at reasonable times, and eat well. And if despite all this you can't get the Tray out of your head for three seconds, play at 2048. You will feel like you are revising your math while having fun! If you want to learn Japanese, this software is for you. To begin, you will learn the Hiragana and Katakana alphabet. IMathGeo is a software available only on Mac that allows you to perform complex calculations very easily but also to draw geometric shapes in space.